David Swanson, author, blogger, activist, and former press secretary to U.S. Rep. Dennis Kucinich, will deliver a Senior Symposium lecture, The Strangest Dream: When the World Banned War, at noon Monday in Memorial Ballroom. 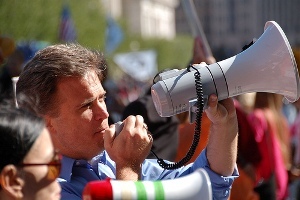 Swanson is the author of “War Is A Lie” and “Daybreak: Undoing the Imperial Presidency and Forming a More Perfect Union.” He blogs at http://davidswanson.org and http://warisacrime.org and works for the online activist organization http://rootsaction.org. He is also the author of “The 35 Articles of Impeachment and the Case for Prosecuting George W. Bush,” by Dennis Kucinich (2008). Check the fall schedule for Senior Symposium.